Give the gift of pure pleasure, a gift to be treasured forever, the gift of platinum. Our platinum pendants are beautifully subtle designs, letting the natural allure of the platinum shine out to create achingly pretty pendants that will be treasured forever. Lovely Platinum and diamond ribbon design pendant. Platinum pendant measures 41mm in length by 4.5mm across. Diamonds are SI 1 clarity G-H color and total approx. .85ct tw in this fabulous pendant. This pendant will slide on a chain up to 1mm in width. 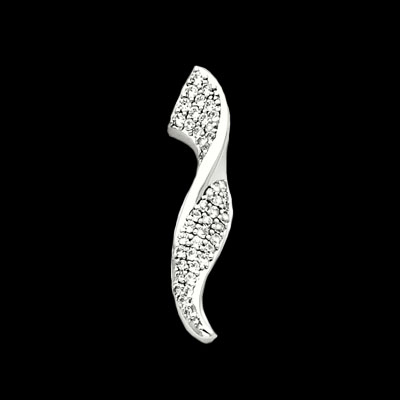 Whether you wear them for ornamentation, as a sentimental symbol, or to simply express your unique personality, platinum pendants are perfect accessories that will last for a lifetime. Gracious Rose has a wide collection of matchless, intricate platinum pendant designs that will suit your taste. We offer everything from simple dog tags for men to sparkly beaded pendants for ladies. Gracious Rose values ethics and aesthetics. Nature never has to suffer for men's beauty. We take great pains to ensure that our precious stones and materials are sourced from environment-friendly suppliers. We use premium-quality platinum to give our jewelleries a shine that is meant to last forever. Platinum never gets old; neither does our commitment to providing the most exceptional designs. We have over 40 designer pendants to choose from and you can create your own by mixing any platinum pendant with any gemstone. You can check out more of our exquisite designs and see our whole collection. Dangling platinum looks beautiful against a woman's neck. Its timeless beauty can also lend fashion and elegance to men's fashion. Gracious Rose creates wonderful pieces that will make your man feel special on any occasion. If your man cherishes his Christian faith, he will love the dainty platinum cross pendants from our religious jewellery collection. You can request to set it with diamonds to add a gracious flair. If he's the rugged type, you may want to check out our platinum military style dog tag pendant paired with a platinum pendant chain. Custom engraving is available upon request. Enjoy the luxury of a safe, convenient jewellery online shopping experience with Gracious Rose. Our jewellery consultants can help you choose from over 3,500 custom pieces and sophisticated designs. You can get the stunning jewellery you have always dreamed of. Pair your platinum pendant with a platinum pendant chain to make the perfect gift for weddings, anniversaries or just any occasion to make someone feel special. You may also choose to set any pendant design with precious gemstones that will add sparkle. You can now get any piece of jewellery delivered to your home for free shipping on orders of $250 and over in 3-14 working days. If you require custom engraving, overnight deliveries or other options not highlighted in the product description, you may place a special order. Give a gift that can be treasured forever. Surprise a loved one and buy Gracious Rose platinum pendant and necklace set with his or her favorite gemstone.